If you’re looking for an odor eliminator that really works, without exposing you or your family to risky chemicals, choose the natural alternative. Choose PureAyre. PureAyre is the strongest, most effective odor eliminator you can buy, and it’s completely safe. 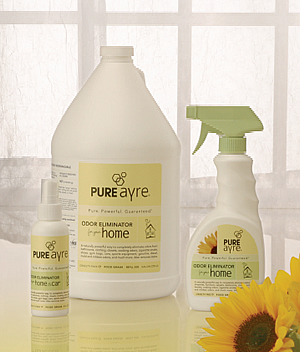 Because it’s all natural, PureAyre’s pure, powerful formula lets you get rid of odors for a clean-smelling home without the hazards of chemical products and artificial fragrances.